I made some pani puri for dinner a few days ago. In spite of the measurement, I was left with a bit of boiled chickpeas and green grams.Decided to use it up in a salad. Delightful was the verdict and refreshing. A clever way to have your proteins if you are a total vegetarian. The following recipe is a rough guideline but add any other vegetables you want to. 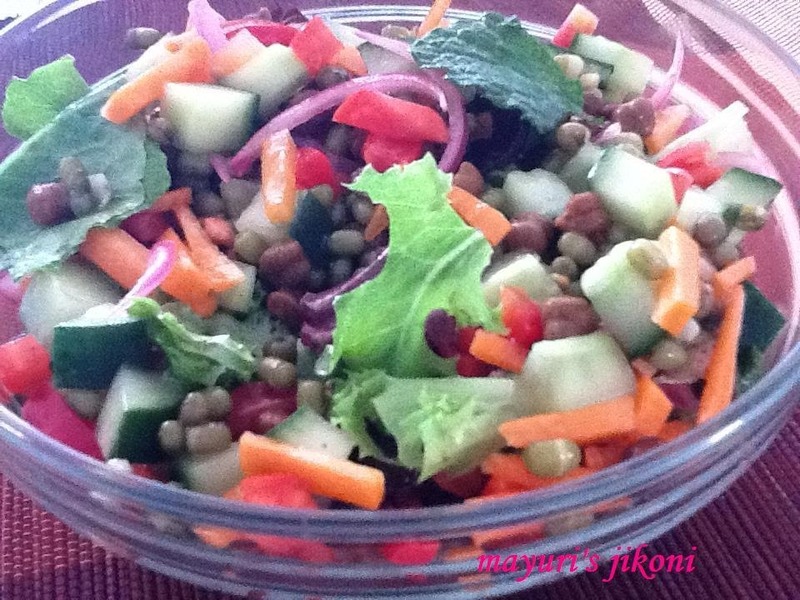 The idea is to have a nutritious and filling salad. I have named it an indian bean salad because chickpeas and green grams are the most commonest beans present in any indian kitchen. Put the ingredients for the dressing in a medium bowl. Whisk it. Add the onion slices to it. Mix well. Cover the bowl and let the onion marinate in the dressing for 30 minutes or so. Mix the rest of the ingredients and leave the bowl covered in the fridge till serving time. Just before serving, mix in the marinate mixture. Toss the salad and serve. Add a bit of grated ginger to the dressing. Use sprouted moong (green grams) instead of boiled ones. To boil green grams, wash and soak the beans in warm water for 1 hour. Put some fresh water to boil in a saucepan. Add a bit of salt. Drain out the water from the beans. Add the beans to the boiling water. Cook for 5 minutes or less till the beans are done. Don’t overcook as you may land up with mushy beans. To cook chickpeas, you need to soak them overnight in warm water. Next day drain out the water, wash the beans and put them in a pressure cooker. Cover the beans with water. Add salt. Cover the cooker and cook for 3 whistles over medium heat. Put some fresh chopped coriander instead of mint. Add chopped green chillis if you like.